I’ve been telling high school students over the last few months there’s not really anything new about poetry slam. The format may have been tweaked a little, but in a sense, it’s just jumping in on a conversation as old as human history; telling stories, celebrating the power of language, bleeding and rejoicing through our voice-boxes. To me, poetry slam is about rekindling an ancient, sacred sense of respect for the uniqueness of every individual voice. The last few years I have been to slams in bars, cafes, tents, state libraries, the Sydney Opera House… but I hadn’t seen one in a school setting. In my mind, that was one of the most exciting places a slam could find itself. I started writing poetry in high school and started slamming in college so I know first-hand that this stuff empowers and liberates and frees students. I know that having your voice validated and your ideas encouraged and affirmed translates into the way you speak and listen in all contexts. So I organised a slam at Hawker College (where I work) about a year ago. It was supposed to just be testing the water really. Then they started asking for more. ANU ‘Voice’ Poetry Slams are a fresh initiative running in 2012, as a result of several slams at Hawker last year, which culminated in an ACT inter-college slam held in November. We had DJs, emcees, poets, monologues, a ukulele, student artwork, and some very special guests from around the place. We tried to make it as dynamic and alive and encouraging as possible. That’s the aim for every ‘Voice’ slam that we run this year. So, a ‘Voice’ slam is a slam, but it’s a little different too. Generally there haven’t been judges. And if a student wants to sing a song with a guitar, or punch out a rap to a beatbox, or pay tribute through performing the words of the poets that have preceded us, that’s been ok. We’re still defining the parameters as we go. But we have started with the basic notion that everyone has a voice, everyone has stories, and they are all worth hearing. There’s a set of performance guidelines basically encouraging participants to use their words to build rather than break, to give life rather than destroy it. And ultimately, the idea is to start to filter performance poetry down into the layers of the school system – so students don’t just discover this stuff when their formal education is finished. We want to reignite a passion for language that is deeply accessible and empowering. I’ve had the privilege recently to speak in a number of ACT schools about poetry and slam, and I’ve been blown away. I’ve seen refugee students share poetry about losing their families, I’ve seen other students perform poetry about video games, about maths classes, about batman, about self-harm, about Harry Potter, about politics. Young people have a huge amount of things to say – perhaps they just haven’t always been given safe places to do so. That’s what this is about. The ACT libraries and the National Year of Reading have partnered with ANU to help host these events and develop stronger links in the community. 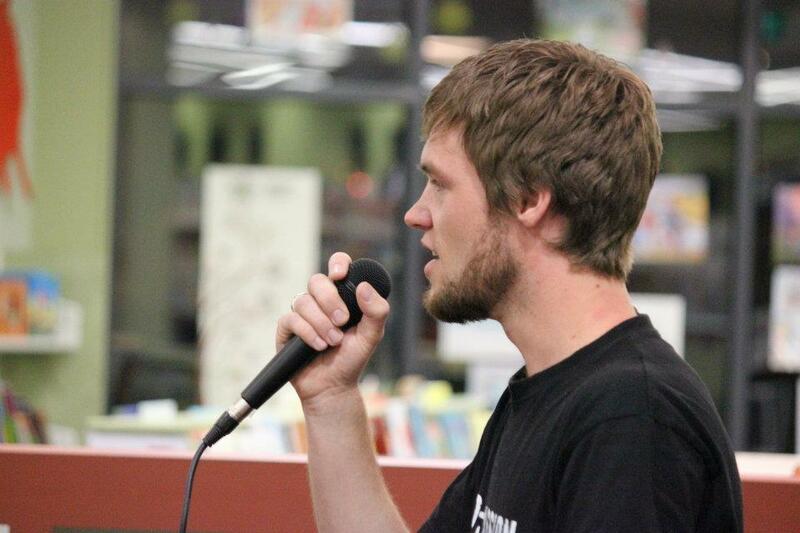 Last week we had the first Voice slam of the year, at Kippax Library. It was an inspirational night. Students from Kingsford Smith School, Hawker College and ANU performed a massively diverse range of poems. We were graced with the presence of special guests, the BRB, a long-time Canberra emcee/producer and Chris Abideen, the founder of the Society of Urban Poets. The students rocked that library. I couldn’t have been more proud. Next up is Erindale Library on the 16th of May and Gungahlin on the 25th of July, and finally on August the 23rd, the ultimate Voice Slam event for 2012, at Theatre 3. So get on board. Like the FB page, check outthe site and contact anuvoiceslam@gmail.com if you want to find out more. ← What’s to Become of Us?